Welcome To New York City! November 29, 2014 · 4 min. readThis article may contain affiliate links. According to Wikipedia, there are 2,562 songs written about New York City. And after traveling there, I can understand why. Being a small city boy who has only ever seen New York in movies and in books, traveling to it was very unlike London or Osaka. New York is a beautiful, and incredible city, and they know it. Walking through the airport terminal, I stopped at a shuttle station and asked for some help getting around. I said, "I have never been to New York before, and I have no idea where to go." The man looked at me and said, "Well, in that case: Welcome to New York, the Greatest City on Earth!" Hopping on the shuttle, I left LaGuardia Airport and headed across the East River and into East Harlem, in Manhattan. Although our direct route through the winding, crowded, honking streets of the island are unknown to me, I could tell we were in East Harlem and Harlem for quiet some time. The old, graffiti covered brick buildings were the first bit of realization that I was actually in the Big Apple. Even the areas of town where tourists avoid had an atmosphere about them that they were the prime examples of America's struggles and accomplishments. 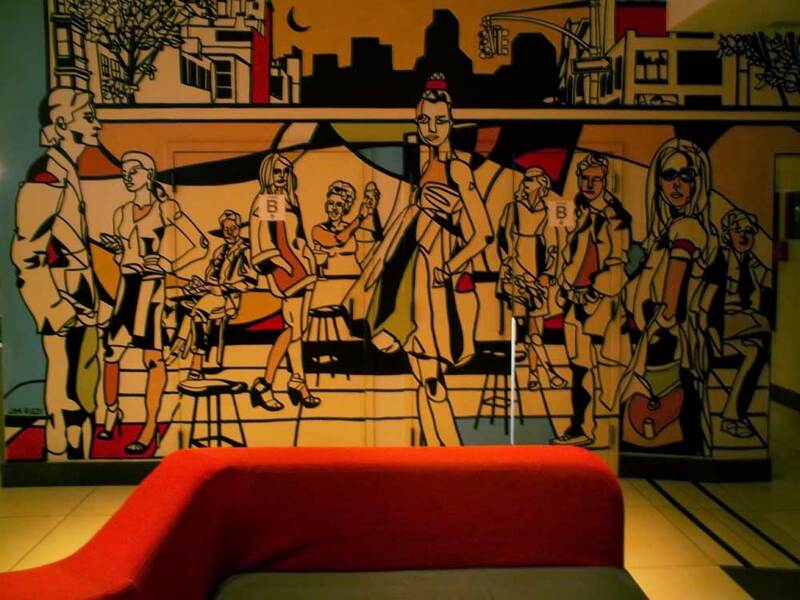 I picked a quirky hotel in Midtown East called The Pod Hotel, and I stayed in Pod 51 for my four days in New York. The Pod Hotel was very small, with my room only being a bed, a closet and a sink. The bathroom and shower was shared, with two being on each floor. My window faced another building, and I could hear traffic on the street below. But in so many ways, the hotel was perfect. Every night it had a movie night, and every morning there was a community breakfast where you could eat on the deck outside and get to meet the other people in your hotel. I decided then to take a walk around my neighborhood. I had no desire to hit up any of the major destinations today. Instead I just wanted to see the city of NYC in it's natural habitat. And I wasn't that far from the river either. I headed East on 51st Street and crossed FDR Drive. I stopped to photograph the cars speeding below me. It was at this time I began thinking that New York is like a organ; a never ending, beating, living thing. That feeling stood with me the entire time I was there. This isn't just a city; it's alive! It was also here where I met another photographer, a very eccentric man who would photograph anything peculiar, including trash on the ground. Looking across the darkening river at Roosevelt Island I saw a strange shape siloetted against the trees. That, the strange building getting less and less visible in the twilight, was an old, abandoned hospital for children with smallpox. It was overgrown, and would soon be demolished. I needed a picture of it. But not tonight. Tomorrow. I will see it tomorrow. And thus, I headed back, plan in mind, excited to learn what other strange secrets New York had in store for me. Having no idea that the hospital was only the tip of the iceberg of places I would explore while in NYC.